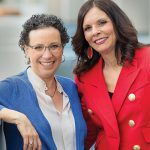 In the fall issue, Cancer Today had the honor of highlighting two women whose cancer diagnoses led them to form a powerful partnership. AnneMarie Ciccarella and Lori Marx-Rubiner met each other after attending a weekly Twitter chat under the social media hashtag #BCSM (for Breast Cancer Social Media). They formed an unbreakable bond that challenged them both—and ultimately affected many researchers.